Nearly 70 Cambridge bicycle accidents were reported at Inman Square in a recent four-year period, with Hampshire Street noted to be one of the most hazardous locations. This by far exceeds the state average bicycle crash rate, with the Boston Bicyclists Union calling it a “ticking time bomb” for crashes. Pedestrians, bicyclists and motorists who use the intersection regularly have voiced confusion, fear and even outrage to city officials. Their lives are risked daily by problems largely resolvable with a better-planned traffic safety infrastructure. Boston bike accident attorneys have concluded one of the most promising ideas floated by Cambridge traffic engineers is the “peanutabout,” the unofficial moniker given to a type of roundabout intersection shaped like a peanut. The peanut design is the only one to gain real traction since the city announced its dedication to make major changes in 2016, following yet another fatal Massachusetts bicycle crash that summer that killed 27-year-old Amanda Phillips. It’s the same design that was recently pitched by bike rider advocates as a potential solution to the traffic problems at Kelly Square in Worcester, according to MassLive. What is the Point of a Peanutabout? What Would it Mean for Bikes? The peanutabout is a traffic infrastructure design that fuses three traffic improvement plans into one: The mini-roundabout, the compressed shape and the best-practices for bikeways. the idea is to improve the harmony among road users, particularly motorists and bicyclists. The mini-roundabout (recommended by the FHWA as an optimal solution for stop-controlled intersections that don’t have an adequate number of right-of-ways), serving to calm traffic, reduce delays noted at typical intersections and lower the crash risk. The compressed shape is what effectively gives a peanutabout its legume-like appearance, more ideal for the existing shape of Inman Square compared to a circle roundabout. The best practices for bikeways involves bicycle and pedestrian lanes that are raised and protected from the roundabout curve where motor vehicles travel. Peanutabouts don’t use traffic signals, but instead force roadway users to pay closer attention and think critically. An example of what it might look like Inman Square in Cambridge was presented to residents in one meeting by traffic engineering firm Kittelson & Associates. For Inman Square, advocates of a peanut intersection design say it has the potential to reduce stress by ensuring fewer points of conflict, in turn slashing the chances of a crash. Crosswalks and bicycle lanes are raised create an added safety feature for pedestrians and and cyclists, the latter of whom would be able to cross through the square with more visibility and very little slowing or stopping. Pedestrians would have the advantage of crossing directly through the center of the square, improving efficiency and safety. Boston bike crash attorneys know that of course motor vehicle operator error is the main reason for bicycle accidents in Massachusetts and across the country. However, the way traffic is designed to flow can inherently be flawed and cause a greater potential for injury. Research has consistently shown that incorporating bicycle safety as a priority in engineering traffic infrastructure associated with a lawyer risk of crashes. 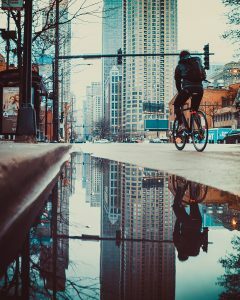 One study published in the journal Environmental Health reveals roads built or redesigned with bicycles in mind are associated with the lowest risk. These include those with marked, on-road bicycle lanes and bicycle routes as well as bicycle paths. Street lighting, low-angled grades and paved surfaces are also associated with better bicycle safety. Throughout the country, there are only a handful of protected bicycle lanes in the country, but most use right angles and all use traffic signals. If Cambridge moved forward with the peanut design intersection, it would be the first of its kind in the country, establishing Cambridge as a model not just for Massachusetts but for the U.S.